. As a result, minute detail that may be masked by more massive 'tables comes bubbling to the surface, heard but not thrust at you." and damping." "The Ace-Space tonearm is a unipivot design with a carbon-fiber armtube for additional damping." Use "Fletcher didnt even feel that an on/off switch was necessary; he expects you to start the platter spinning by hand." "Setup is relatively simple, provided youre familiar with turntables."
. Should it be considered right up there among the ones you really ought to audition before settling down with one final choice? You betcha." Turntable designers seem to gravitate in two opposite directions. The first group trusts the tried-and-true suspended-turntable design, either with or without the outer cabinet. The other group -- in fact, the majority of turntable designers these days -- has "gone solid," as in a plinth with no suspension of any kind. Of the latter, there are also two camps. The first is the "if some is good, more is better" faction. Members of this group build massive turntables to overpower resonance. The second camp believes in using only the materials necessary to do the job of spinning the LP right. Nottinghams chief, Tom Fletcher, belongs to this last group. His Space Deck turntable and Ace-Space tonearm are minimally designed to just do the job of LP playback and then get the heck out of the way. Fletcher didnt even feel that an on/off switch was necessary; he expects you to start the platter spinning by hand. His feeling is that if a motor needs to be powerful enough to get a heavy platter spinning from a dead stop, it won't spin as effectively as it should at the proper speed. One of the pleasant byproducts of this school of design is that, due to the absence of anything extraneous, the turntables end up being extremely attractive. The Nottingham Space Deck is no exception. It looks so good, in fact, that my wife, who has little use for anything audio, expressed her approval at its appearance. There aren't many pieces of audio equipment I can say that about. The Space Deck begins life as three circular feet -- two of which are height adjustable. Bonded to these feet is the round plinth made of what feels like fiberboard that's coated with a vibration-damping material and cut to the same size as the platter, which sits atop it. The circular tonearm-mounting base, which is fitted with a metal insert to hold the 'arm in rigid fashion, is set neatly in place atop one of the mounting feet. The only other mandatory part of the 'table is the circular motor housing -- a half-moon cutout on one side assists in placing it properly next to the turntable -- and the round, rubber drive belt. Thats it. Nothing extra that doesnt contribute to the sound is added. Oh, before I forget, there's the platter. It's made of a heavy alloy material and is banded with two large rubber bands that both aid in starting and stopping the 'table -- which, as I mentioned, you do manually -- and damping. The platter is topped with a foam pad and a unique dust cover. No massive Plexiglas lid for a Nottingham 'table -- itd look out of place. Instead, Tom Fletcher uses what, at first glance, appears to be a grooveless record. It fits neatly and covers just the platter. Simple, ingenious. Setup is relatively simple, provided youre familiar with turntables. First, level the 'table. Then, place a few drops of the supplied oil in the bearing hole. Drop the spindle into the bearing hole and allow it some time to settle onto the Admiralty bronze bearing, which uses a soft inner and hard outer layer to increase life expectancy. The Nottingham Space Deck has few parts, and those it does have are of high quality. Nottingham notes that, for the 40+ years theyve been building the 'table, replacement parts -- even drive belts -- are rarely requested. The Ace-Space tonearm is a unipivot design with a carbon-fiber armtube for additional damping. Its (surprise, surprise) simple and easy to setup and use. Well, sort of. In his drive to keep his designs as simple as possible, Tom Fletcher pares the Ace-Space 'arm of anything he deems unnecessary to making music, including a finger lift, which he thinks just adds a resonance point to the tonearm. Hence, the only way to raise or lower the 'arm is via the lifter. Fletcher also dispenses with any form of silicone damping. This is highly unusual for a unipivot tonearm. As Fletcher puts it, "This [silicone damping] method is forever trying to settle down whilst you are playing a record." He also feels that silicone damping adds to setup difficulties. Instead, he centers the pressure point as close to the 'arms center as he can and adds two stabilizer bars -- one on each side -- to keep the 'arm from rocking on its azimuth. This generates the required damping. Quaint and, again, ingenious. The final element to the Nottingham Space Deck is the large square base. Besides looking nice, the base gives you an elegant fixture on which to set the turntable. It adds a measure of classic-turntable appearance to the Space Deck, though, as Nottingham is quick to point out, it doesn't really enhance the sound. They suggest trying the 'table on other surfaces, after-market or otherwise, and picking the one you find that sounds best. I left the base under the 'table for the review period, as thats the way Nottingham sells the Space Deck. Oh, yeah, the color scheme. Tom Fletcher will build you any color 'table you like so long as it's Nottingham's standard marbled blue. The part of the presentation that's sorely lacking is the owners manual. To put it bluntly, it stinks. One printed page and one basic line drawing just dont cut it. This 'table/'arm combo -- not to mention its prospective buyers -- deserve better. But hey, thats why youre buying from a dealer. That makes setup his problem, not yours. The Space Deck is sold with the Ace-Space for $2999 USD. You can buy the Space Deck alone for $1799, and the Ace-Space for $1499. The Nottingham Space Deck and Ace-Space are not what anyone would consider a shy kitten, sonically speaking. Every instrument is extremely well delineated and portrayed in its own space, making for a lively, exciting presentation. This is true both of well-recorded stereo or mono LPs. Jackie McLeans Swing, Swang, Swinging [Classic/Blue Note BLP 4024] is a case in point. You wont have any problem telling whose album this is. McLean is front and center (yes, this is a mono recording, so of course hes in the middle), but the rest of the band is identifiably set back behind him in the recording. Power amplifiers  Bryston 4B SST stereo amp, Vincent Audio SP-T100 monoblocks. Preamplifier  Audio Research SP16. Analog  VPI HW19 Mk IV turntable, Butternut Audio-modified Rega RB300 tonearm, Clearaudio Aurum Beta S cartridge. Interconnects  Alpha Core Goertz TQ2, DH Labs BL-1, Harmonic Technology Pro Silway Mk II. Speaker cables  Alpha Core Goertz MI2. Power cords  Harmonic Technology Pro AC-11, LAT AC-2. Accessories  Target TT3 equipment rack; Symposium Ultra Platform and Svelte Shelf platforms; Symposium Precision Couplers, Roller Block Series II, Roller Block Jr., and Fat Padz footers; Monster Cable HTS 1000 power center. Due to that wonderful delineation, I could hear deeply into each recording -- or at least as deeply as the recording allowed. Intrinsic noise is extremely low, no doubt a byproduct of Tom Fletcher's no-frills approach. As a result, minute detail that may be masked by more massive 'tables comes bubbling to the surface, heard but not thrust at you. The Space Deck/Ace-Space combo favors the leading edge of a transient over the harmonic, but not to the undoing of overall balance. For a wonderful example of the strengths of this 'table/'arm setup, slip For Duke [M&K Real Time RT-101] on the platter. Musically, this isnt the best example of jazz around. Sonically, however, its another story. This is one of the best-sounding albums Ive ever heard. All instruments are in-the-room real. With the Nottingham duo, each instrument's tone was spot on, from the blat of the trumpet, to the woody resonance of the bass, on through the snap of the drum kit. Each instrument was properly located within the soundstage. Ive rarely heard music reproduced better. It was magical. The Space Deck wont shake your room with deep, thunderous bass, and it wont chisel your ears off with etched, ringing highs. The extremes are there in good proportion -- the treble in particular is nicely handled. Gary Burtons vibes on Like Minds [Pure Audiophile/Concord PA-002 (2)] shimmered with an almost-lifelike realness, missing only that final iota of sheen thatll let you forget youre listening to a recording. Dave Hollands upright bass was woody and detailed, though not quite as deep as Ive heard from other 'table/'arm combos. Placing a well-recorded stereo classical LP, such as the Mercury Living Presence recording of Mozarts Eine Kleine Nachtmusik [Mercury SR 90121], on the platter brought the Nottingham combos soundstaging ability into full focus. Naturally wide and fairly deep, the orchestra was portrayed as separate sections bound into a complete whole. I could follow any section I chose for as long as I chose. Evenly balanced, the Nottingham duo combines its attributes so cannily that I was hard-pressed to notice them, so engrossed in the music was I every time I cued up an album. Surface noise is a bit more prominent than Im used to, and overly hot recordings, especially of the rock'n'roll variety, could be a bit of tough sledding, but in the final analysis balance was maintained throughout each listening session. Heres a classic comparison. The Nottingham 'table is simply built and has no suspension. The VPI HW19 Mk IV is a larger, classic-looking plinth-in-frame 'table with a full suspension. The prices are close -- $2999 for the Nottingham pair, $2625 for the VPI/Rega combo when purchased a few years ago. Listening to both will leave you with a clear preference, as it did me. The Nottingham rig is quick, up-tempo, and agile. It favors the leading edge of transients without short-changing the balance of the harmonic spectrum. It also highlights ambient information very well. The VPI/Rega rig is fuller and richer. I heard more of the instruments' body, deeper bass, and more harmonic information, while still getting a good sense of a sharply plucked guitar string. For me, these differences were best exposed while listening to my copy of Mozarts Violin Concertos Nos. 3 and 4 with David Oistrakh and the Orchestre Philharmonique de Berlin [EMI 2C 069-02324]. Via the Nottingham pair, Oistrakhs violin was all sharply defined, beautiful string sound. He was clearly front and just to the left of center in the soundstage. The Orchestre Philharmonique de Berlin danced right along with him in lockstep. The VPI/Rega combo offered more of the violin's wooden body and made the orchestra a more powerful, if not quite as agile, entity. Both were enticing and fun to hear. While I could easily live with the Nottingham Space Deck turntable and Ace-Space tonearm and never worry about upgrading, I'm still firmly committed to my reference analog rig. While I can respect and enjoy what the Nottingham pair did, I crave fullness (but not too much) and deep, rich bass. The VPI/Rega duo achieved this better than the Nottingham rig. A musical analogy: The Nottingham combo was Charlie Parker, the VPI/Rega rig Ben Webster. By all means, you need to hear both, as each offers its own sets of strengths and one will come closer to scratching your musical itch than the other. However, either will bring years of record-playing enjoyment. Youve got to respect a man whose vision of the correct way to build a turntable hasnt changed in 40 years. Tom Fletcher may have taken some ribbing -- especially early on -- for his singular ideas, but look at how many other companies have followed suit in the intervening years. If you listen to a Nottingham analog rig, Im sure youll find yourself as impressed as I was at just how nimbly the Nottingham Space Deck turntable and Ace-Space tonearm reproduce favorite albums. Is the Space Deck/Ace-Space combo the best-sounding turntable/tonearm system available in the $3000 price range? Thats hard for me to say, as Ive not heard all or even a good amount of the competition. Should it be considered right up there among the ones you really ought to audition before settling down with one final choice? You betcha. Sometimes simple really is better. 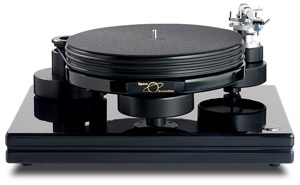 Prices: Space Deck turntable with Ace-Space tonearm, $2999 USD; Space Deck alone, $1799; Ace-Space alone, $1499.